Definition at line 120 of file trust-anchor-group.hpp. Create a dynamic trust anchor group. This contructor would load all the certificates from path and will be refreshing certificates every refreshPeriod time period. Note that refresh is not scheduled, but is performed upon "find" operations. 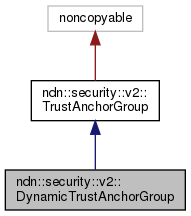 When isDir is false and path doesn't point to a valid certificate (file doesn't exist or content is not a valid certificate), the dynamic anchor group will be empty until file gets created. If file disappears or gets corrupted, the anchor group becomes empty. When idDir is true and path does't point to a valid folder, folder is empty, or doesn't contain valid certificates, the group will be empty until certificate files are placed in the folder. If folder is removed, becomes empty, or no longer contains valid certificates, the anchor group becomes empty. Upon refresh, the existing certificates are not changed. path File path for trust anchor(s), could be directory or file. If it is a directory, all the certificates in the directory will be loaded. refreshPeriod Refresh time for the anchors under path, must be positive. Definition at line 86 of file trust-anchor-group.cpp. Definition at line 104 of file trust-anchor-group.cpp. 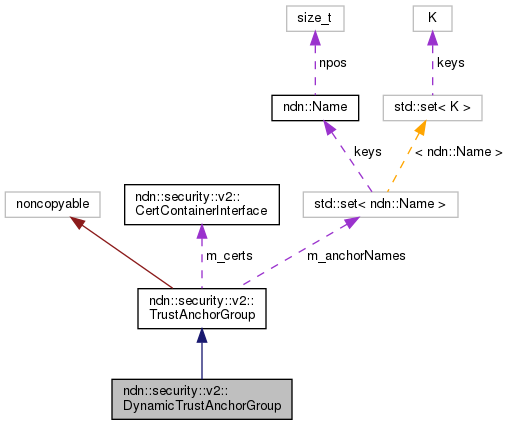 References ndn::security::v2::CertContainerInterface::add(), ndn::security::v2::TrustAnchorGroup::m_anchorNames, ndn::security::v2::TrustAnchorGroup::m_certs, NDN_LOG_TRACE, ndn::time::steady_clock::now(), and ndn::security::v2::CertContainerInterface::remove().